A researcher studies the effects of UV radiation. 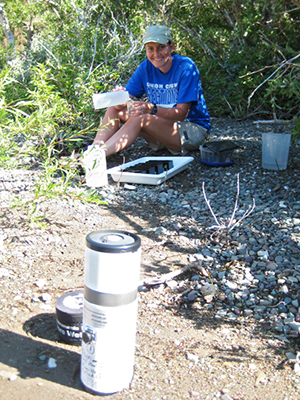 Students earn a degree in Ecology, Evolution, and Environmental Biology (EEEB) but closely interact with one or more departments. Although there is no Master's degree program in EEEB, Miami also has Master's and Ph.D. Programs in Ecology, in which students earn a Certificate in Ecology. The EEEB program emphasizes basic and applied research and training, with a major focus on the application of ecological and evolutionary principles to environmental issues. The program provides students with educational experiences that reflect this emphasis, and facilitates collaborations and interactions among students and faculty. All students are supported with teaching assistantships, research assistantships, or fellowships. Students interested in applying to the EEEB program should review the research interests of the faculty associates, each of whom can serve as a dissertation advisor. Potential applicants are encouraged to contact faculty to learn more about their research programs.